Writing Suspense? Will it work? Will she find out before it’s too late? Will they ever be able to set aside their differences? Will the child give the game away? Will the dog manage to get help? Can they hold on for long enough? What if it all goes terribly wrong? A certain level of suspense is desirable in all stories – it keeps readers reading! Suspense relies on the questions that arise in the reader’s mind as they read a story. These questions, in turn, create positive or negative expectations as to their answers. When the answers to the questions and thereby the resolution of these expectations is delayed, the reader experiences suspense. 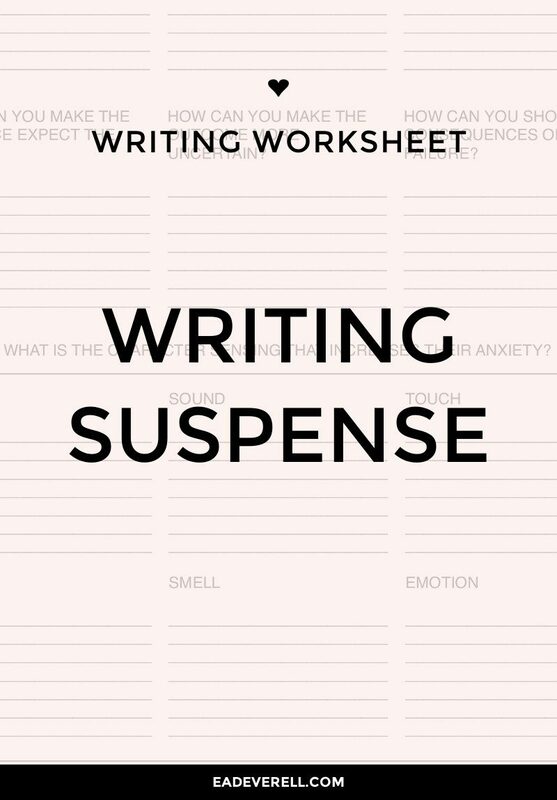 Simply clarifying these 3 elements of suspense can help you write a more suspenseful story. 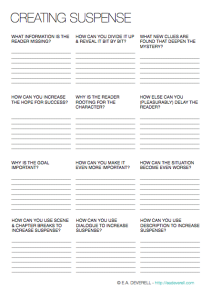 The questions in this worksheet will help you do just that. One of the most useful tasks when writing suspense is to uncover hidden assumptions. This allows you to understand the questions that are likely to occur to the reader, and to manipulate their expectations. It can also be helpful to explore anticipation. 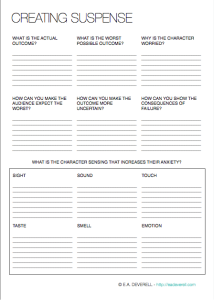 How will the character or reader think and feel before, during, and after the resolution of suspense? Although delay is vital for creating suspense, a ticking clock can add pressure to the reader’s desire to resolve the suspense, making the delay feel longer. Mysteries are the best way to create and resolve suspense. Suspense often relies on the writer withholding information from the reader, but not always! It’s also possible to create suspense by presenting certain information to the reader, but withholding it from the character. For example, when the reader knows that someone is lurking around the corner, but the character is unaware of them. Suspense is often crucial to giving plot twists their impact. Keep regenerating questions, answers, expectations and delay, and you’ll easily sustain the suspense right to the end of your story.